Big L's first album. Includes the singles ''Put It On'' and ''M.V.P.'' Lifestylez Ov Da Poor & Dangerouz solidified Big L's status as a Hip Hop legend despite being the only studio album released prior to his tragic death in 1999. 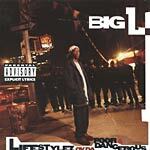 Traffic Entertainment is proud to release Big L's classic debut album in a double-LP pressing for the first time ever. Remastered from the original tapes and pressed on loud double vinyl.